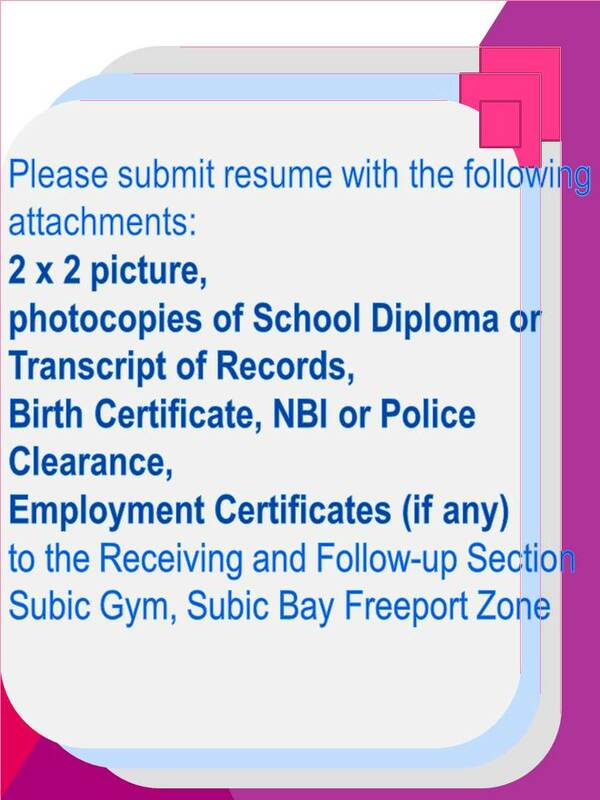 Candidate must possess at least a Vocational Diploma / Short Course Certificate; At least 2 years of working experience in the related field is required for this position; Must have background in machine’s electrical repairs, electrical wiring and installation; Know how to read electrical wiring diagrams, trouble shoot, repair motor and controls of machines/equipment facilities; Experience in repair and maintenance of air condition system is an advantage. Graduate of any Accounting or any Business related course or relevant field; Working knowledge / experience in Inventory Job in a manufacturing company is an advantage; Can follow instructions and can work with a team; Can handle pressure and can work with minimal supervision; Willing to render overtime. Male; At least College level; With at least 1 to 2 years of experience in Korean or Western and International cuisine; Has average English communication skills; Can work with minimal supervision; Comply with laws and regulations governing food preparation in institutions; Handle stressful situations in a professional manner, including angry or difficult customers; Can understand and practice safety procedures and precautions; Must be physically fit. Male / Female; 5’3” in heights for Female and 5’6” for Male; Candidate must be College level; With Sales experience; Experience from the retail (Footwear/Apparel) industry is an advantage; Must be customer service oriented; Must have average English communication skills (written and oral). Male / Female; 5’3” in heights for Female and 5’6” for Male; Candidate must be College level; With Sales experience; Experience from the retail (Footwear/Apparel) industry is an advantage; Must be customer service oriented; Must have average English communication skills (written and oral); With pleasing personality. Male; College Degree; Minimum of 5’6” in height; Presentable and well groomed; Articulate; Good spoken and written English; Knowledge of computer; Knowledge on Hotel Property Management System is an advantage; Able to work flexible hours and holidays; Good customer interaction skills; Operational processes; Administration skills; Preferably 1 year experience on any service oriented establishment is an advantage; Displays initiatives and hardworking; Willing to go extra mile to exceed guest expectations; Motivated. Male; High school diploma; Presentable and well groomed; Must be able to communicate in English; Able and willing to work flexible hours and holidays; Good customer interaction skills; Operational processes; Administration skills; Preferably 1 year experience on any service oriented establishment is an advantage; Displays initiatives and hardworking; Willing to go extra mile to exceed guest expectations; Motivated; Trustworthy. Graduate of any Business related course; At least 2 years work experience; Good customer service skills; Can work with less supervision; Flexible, systematic, reliable and trustworthy. Female; 5’2” in height; At least with 2 years work related experience; Good customer service skills; Computer literate; Able to handle multi-task and can work under pressure. Good customer service skills; Physically fit; Can work on any shifting schedule. Skilled for applying basic fixes to equipment and building system; Solid technical knowledge; Possess manual dexterity and physical stamina; Excellent communication and interpersonal skills; Knows how to drive and with valid driver’s license. In depth knowledge of legislation and procedures; Knowledge of potentially hazardous materials or practices; Experience in writing reports and policies for health and safety; Certificate in Occupational Health and Safety; Diligent with great attention to detail and outstanding organizational skills. Female; College level / Graduate of BS in Hotel & Restaurant Management or Vocational courses on Food and Beverage; At least 6 months to 1 year experience in hotel/restaurant industry; good communication, PR and sales skills; Must be honest and with trustworthy attitude; with excellent communication skills in English; Ability to multi-task and work well under pressure in a fast-paced environment. Male / Female; At least College graduate of any course; With at least 2 years work experience as HR Staff; Must be able to communicate clearly, both written and oral, to communicate with employees, members of the HR management team, and in group presentations and meetings; Must be dependable, able to follow instructions, respond to management direction, and must be able to improve performance through management feedback; Must possess strong interpersonal skills; Must be organized, accurate, thorough, and able to monitor work for quality; Can work under pressure.